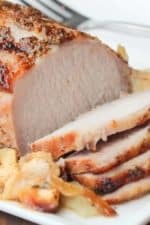 The brine for this Perfect Pork Loin Roast recipe ensures this to be super moist and bursting with flavor. I love to cook directly on top of the veggies. This is such a wonderful dish and truly impressive. You can’t go wrong with this one. Make the brine the day ahead and then cook to pure perfection. We just love the fruits and vegetables that boost the flavor profile of this incredible dish. 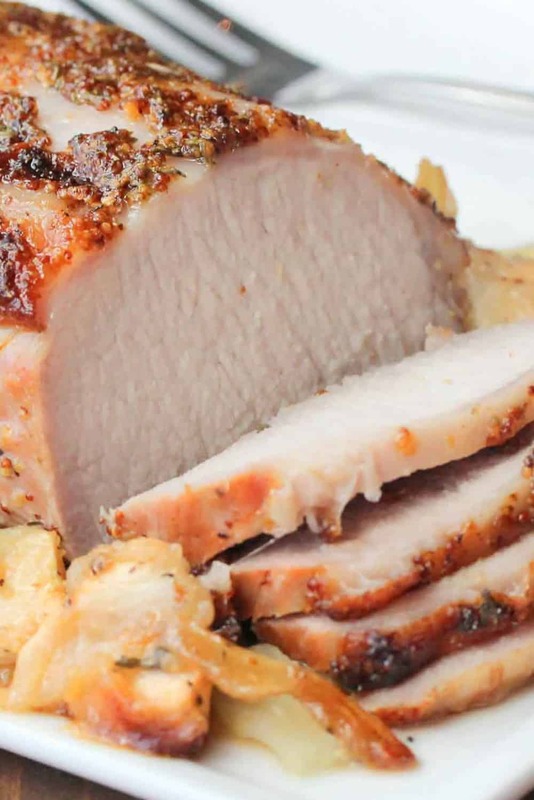 This Perfect Pork Loin Roast recipe really is perfect. It is the ideal dish to serve at holidays or anytime you need something special for when guests arrive. You will not be disappointed in this roast! 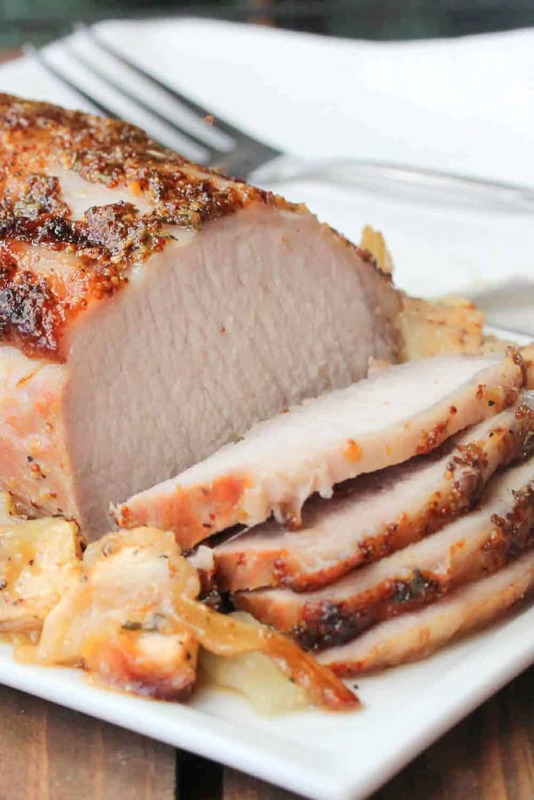 Now, let’s make this Perfect Pork Loin Roast recipe! This perfect pork loin roast gets a nice brine and then a maple-mustard crust when it bakes. Cook along with the apple and fennel, and wow oh wow, is this good! Combine 2 cups of the apple cider with the salt, brown sugar, garlic, and thyme in a large saucepan and and bring to a boil over high heat, stirring constantly, until salt and sugar dissolve, about 3 minutes. Add the remaining apple cider and let cool to room temp. Transfer to a large container, or a brine bag. Add the pork, cover (or seal the bag), and refrigerate for at least 8 hours, or up to 18 hours. Position a rack in the center of the oven, and heat oven to 450 F.
In a small bowl, mix the maple syrup, mustard, thyme, and pepper. Drain the pork and pat dry with paper towels. Brush the pork all over with the mustard mixture. 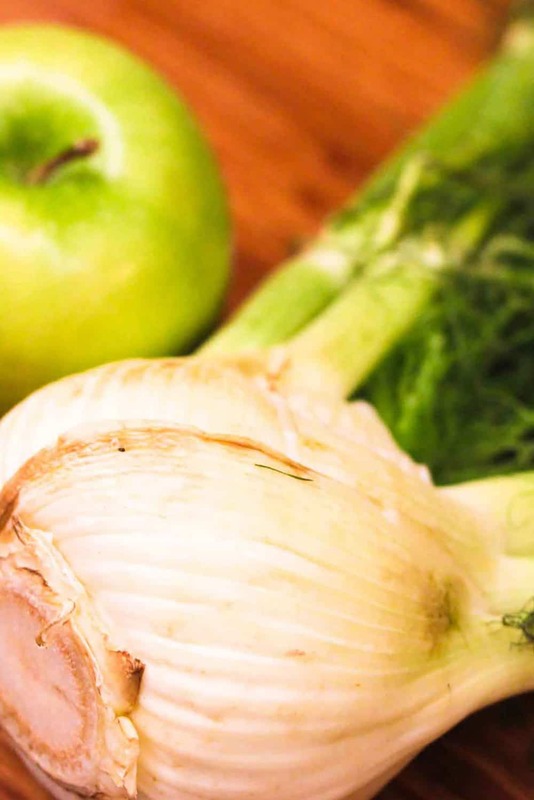 In a medium bowl, toss the fennel and apple with the oil, salt, and a good pinch of black pepper. Scatter the mixture in the bottom of a large roasting pan (large enough to hold the pork with an inch or two of space around the edges). Put the pork, fat side up, on top of the fennel and apples. Roast the pork until the crust just starts to brown, about 20 minutes. 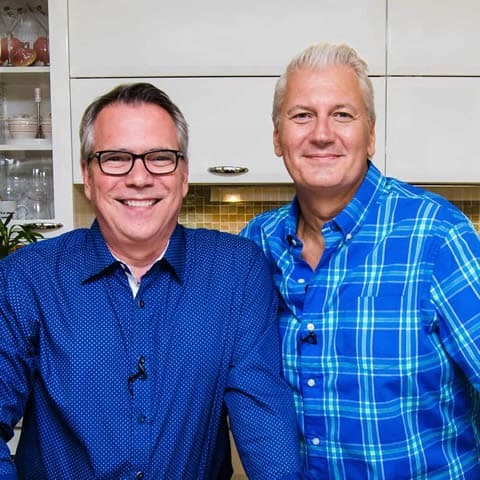 Reduce the heat to 350 F and continue cooking until an instant-read thermometer inserted into the thickest part of the loin reads 145 F., about 40 to 50 minutes more. Serve, topped with the fennel, apple, and juices. Just made this. Actually in the oven NOW! Lol! Haven’t really used fennel so I excited to try something different. If it taste half as good as it smells, it’s gonna be delicious!! There are not enough superlatives for how good that roast looks. I usually use apple juice instead of cider and roast mine plain, but I’ll use your glaze for our New Year roast. Thanks for sharing. Thank you so much and we’re excited to hear if you made the roast, and if so, how you liked it! Thanks for sharing this recipe – it’s a keeper and our new family favorite. We’re not big fans of fennel so I halved it – delish!